Simply the BEST application for tarantula record keeping! For those of us who get seriously bit by the hobby and find ourselves keeping dozens of these fuzzy little arachnids, a conundrum soon presents itself. How do we keep track of data? Many hobbyists find it necessary to track feedings, molts, enclosure cleanings, temperatures and other observations about their pets. This information can prove very useful in recognizing patterns and behaviors and for noticing when something might be amiss. What is the average time between molts for a certain specimen? What was the feeding schedule during that period? Was there any difference in growth rate when the temps dropped for the winter? These are all some questions I’ve actually posed and answered using data. When my collection first grew from one specimen to 10, I found it easy to record feeding and molts on the family calendar. However, my Norman Rockwell wall calendar was soon so filled with tarantula names and observations that we didn’t have room for birthdays. It quickly became apparent that I would need a better way of recording and organizing my data. I would need to do some homework. I hopped online and Googled “tarantula journal” and “tarantula record keeping”, but my searches really didn’t yield much in the way of results. It looked for a while like I would have to come up with my own system using a notebook to journal. It wasn’t until I signed onto Arachnoboards one day and noticed a simple little post that all of that changed. That was the thread’s title, and I was immediately intrigued as I clicked on the link to read more. Reading the post that described this app, my excitement built. An app designed specifically to track tarantula data? Unlimited slots for larger collections? To say that I was excited as I quickly clicked the link to download this app would be an understatement. After installing it on my Kindle Fire, my excitement only grew as I played around with the program and familiarized myself with its many outstanding features. Did it offer the ability to track feedings, molts, and date of acquisition? Could you add photos of your specimens? Were you able to select venom potency and behavior, each with its own handy symbols? Customizing listings for all of your tarantulas is simple. And there is just so much more. The app’s creator, Erick Banaag, didn’t just stop there; he continued to tweak, improve, and perfect this tool. Over the last couple years, Erick listened to user feedback and suggestions as he continued to evolve the program to include more and more information and features. The result is the most comprehensive tarantula app ever offered. The amount of data it allows you to track is just staggering, and the number of available components will appeal to both the novice and expert tarantula keeper. 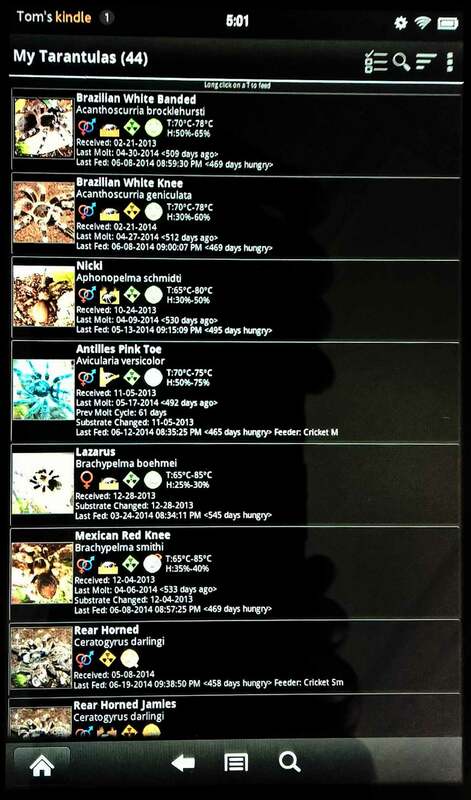 Whether you have 10 tarantulas or 100, this amazing little app has something for you. I’ve been using the app for well over a year, and it’s worked flawlessly for me (and even if I ever did find a bug, Erick has continued to provide support and updates for the program, so a fix is always on the way). I’ve actually made it an integral part of my ritual for receiving new tarantulas. After unpacking and rehousing my latest acquisitions, I take a picture and add the new specimens to my app. With the latest version of this stellar application now available, I reached out to Erick to find out a little more about the creation of this wonderful tool and the man behind it. TBS: Thanks so much for taking the time to chat with us! To start off, I guess the first thing folks are wondering is how did you get the idea for the tarantula app? How did this project come around? Erick: To be honest, it is not my original idea. When I started with the hobby I found a free app that allows for only a few entries and you’ll have to pay to get more slots. As cheap as I am, I decided to make my own. I wasn’t really planning on releasing the app to the public since it wasn’t my idea and it was around 70 to 80% similar, but I’m happy I did. It has now grown so much and a lot of the features were from user suggestions. Without users’ input/suggestions, the app would not be what it is now. TBS: How does one go about creating an application? Do you have previous programming experience? TBS: Were there any challenges in creating an application with so many features and so much customization? The amount of information it allows you to track is staggering, so I imagine that all of these features didn’t come without a fair share of programming headaches. Erick: I did have to learn android development, but I already had some background of the programming language used. TBS: Something that has really impressed me having downloaded this app early on is just how much work you’ve done to constantly improve upon it. You have your own dedicated thread on Arachnoboards in which you announce new versions and take feedback from the keepers who actually use it. About how many versions have there been, and how many hours do you spend on each version? Erick: Since the debut, there have already been 55 version releases. I usually spend around 8 to 10 hours, depending on the update; maybe longer if there are big changes to be done. Or even under an hour for really small quick fixes. TBS: What type of response have you received from the app? Everyone I’ve encountered has loved it. I’m assuming the response has been quite positive? Erick: So far the majority are positive responses. I also get emails every once in a while letting me know how happy they are with the app, which also makes me very happy. TBS: Which devices does the app currently work on? I’m a bit of an iconoclast with my Windows phone, so I use the app on my Kindle Fire (and it works fantastically). Erick: The list of compatible devices on my website is currently based on user responses and email messages. But based on the three app stores that the app is currently listed in, it should be compatible with the majority, if not all, of the android devices available on the market as long as they are running android 2.1 and up. TBS: Are there any plans for an ios version in the future? Erick: I’ve been planning to port the app to iOS, but unfortunately my time and, most importantly, knowledge of the platform is very very limited. TBS: With all of the revisions you’ve made to this application, I can only imagine that you’re currently working on the latest additions and fixes. Can you tell us or hint at what might be coming next? Erick: Unfortunately, my to-do list now is mostly bug fixes with only one update, which is a request I got from Arachnoboards. If you use the feeding feature by long pressing an entry in the list, the request is to make it so that if you press on one side, it will update the feeding date. Press on the other side, and it will update the watering date. I sometimes get emails or even Facebook private messages from users suggesting features but now most are bug reports. TBS: If I’m not mistaken, you currently live in the Philippines. When I first started my blog, I was surprised to discover that many of my visitors are from the Philippines (third only to views from the United States and UK). In the US, tarantula keeping is still a bit of a niche hobby that is currently gaining more popularity. How popular is the hobby in your country? Where do folks get their tarantulas? Mail order, local pet stores, etc? Erick: I would say the hobby is still young here in the Philippines though getting more and more popular at a really fast pace. Tarantulas are easy to find here, if you know where to look for them. There are plenty of selling groups, and finding a seller close by is pretty easy. Some would do mail orders for rare species that only a few big dealers would sell through the mail. TBS: One of my favorite tarantula species is the Orphnaecus philippinus, a species native to the Philippines. Do you keep any of the indigenous species you can find there? Erick: I currently don’t own any local species. My focus is shifting to arboreals, and I’ve been searching for local arboreals, which seem to be very difficult to come by. TBS: I figured that anyone who would spend hours programming an app for tarantula keepers probably had tarantulas himself. What species do you current keep? 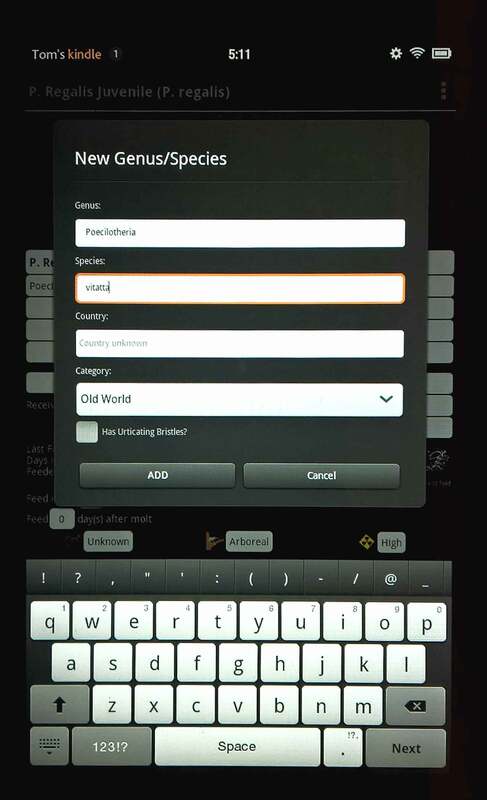 What is your favorite species (or genus)? TBS: Again, Erick, thank you so much for your time! I’m sure I speak for many people when I say thank you for all of your hard work on this app. I can’t wait to continue to watch it evolve and, hopefully, reach even more keepers. Find this application now on the main site , or on Google Play! For those interested, you can follow the update thread on Arachnoboards. The new “jewel” of the hobby. Over the years, there have been dozens of newly introduced tarantulas species that have caught the eyes of hobbyists with their undeniable beauty and the appeal of being a rarity in the hobby. More recently, the Poecilotheria metallica and Monocentropus balfouri were two spiders that delighted keepers with their gorgeous blues while draining wallets with their steep costs for even the smallest slings. Even today, with both species being readily available in the hobby, they still command high prices. Today, many keepers consider the Harpactira pulchripes, a striking orange bodied and metallic blue legged beauty, the hobby’s latest crown jewel. This relatively new African species pops up on many keepers’ wish lists, and folks who manage to acquire one proudly share photos like a rich kid showing off his new sports car. And like a status car, these little spiders can come with a shocking price tag that many find ridiculous. The fact is, new species, especially African ones like the Harpactira pulchripes are first collected and bred by Europeans and exported to the United States in limited quantities. Couple the cost of legally importing tarantulas into the US with their initial limited availability, and you have the makings of one pricey T.
Check out my female in action in the video below! Early on, the only folks generally interested in paying these prices, often reaching well over $1,000 for a pair, are breeders looking to be the first to breed the species stateside (and make a pretty profit in the process). Other interested hobbyists will often wait a year or two until a new species is successfully bred a couple times, bringing batches of more affordable slings into the marketplace. When I first saw a photo of a H. pulchripes, I had only been really into the hobby for a short time and I had no idea that I was viewing a newly introduced spider. I was therefore shocked when I saw that .5″ slings were going for about $500. It didn’t take me long to abandon all hope of acquiring this gorgeous spider any time soon. In about January of last year, I got a lead that one of the breeders I normally buy from was expecting a shipment of babies, and slings would be available for $300 each or $275 a piece if you bought three. Although I considered making a purchase, that was a still a bit out of my price range. Over the next several months, I watched as prices for .5″ slings decreased from this price point to as low as $225 from one dealer. With a few folks managing to produce slings in the US, prices were already falling. Finally, I found an offer that was almost too good to be true. Stamps Tarantulas was offering 2.5″ sexed female juveniles for $300. Even better, he was having a 25% off everything sale. I would be able to get a guaranteed female for less than I almost paid for a single unsexed sling. I jumped at the opportunity and placed my order. Now, there was a slight mix-up with my order, which lead to me being sent a 1″ sling instead of my female. Steven was quick to rectify the situation, and when all was said and done, I was the proud owner of both a H. pulchripes sling and a sexed juvenile female. To say I was a happy customer would be the understatement of the year (thanks, Steven!). I used a basic setup for both specimens, a modified 1 quart clear plastic canister for the sling and a 1.5 gallon Sterilite container for the juvenile. I modified both to add ventilation (holes for the canister and round vents for the Sterilite container). For substrate, I used a mostly-dry combination of peat and coco fiber. After packing this down in the enclosures, I packed some dry substrate on the top. Both were offered cork bark with some plastic leaves for a hide, and I used my finger to pre-start a burrow for each under the cork bark. The juvenile has a milk cap for a water bowl, and I keep it filled with fresh water (although my girl has enjoyed filling it with dirt). The sling will be getting a water bottle cap for a dish soon. For the time being, I use a water dropper to add some moisture to the plastic plant and webbing in case it wants a drink. Both specimens took to their burrows the first night, and they have spent several weeks burrowing a bit and webbing up around the entrances. Although each has constructed a fairly deep burrow in the substrate, they are both out and visible quite often (the sling does move to one of its holes whenever I disturb its enclosure). Both of my pulchripes have been great eaters. I drop a cricket in overnight, and it’s always gone in the morning. When I first got my sling, I didn’t have a cricket small enough for it as I was expecting a 2.5″ juvenile. Therefore, I dropped in a pre-killed cricket for it to scavenge feed on. When I checked in the morning, the sling had dragged the carcass beneath the cork bark and had devoured the entire thing. On average, I feed this specimen three times a week. While the weather is warm, I’ll be taking advantage of its higher metabolism to grow it out of the more fragile sling stage faster. The juvenile has had no trouble taking down medium-sized crickets; I just drop them in at night, and they’re gone in the morning. She has currently sealed herself up in her burrow for premolt, so I’m eagerly awaiting the impending shed. Before she stopped eating, I was feeding her on a twice a week schedule. Like most of my baboons, the H. pulchripes don’t get as fat in the booty as some of my New World terrestrial Ts get when they are about to molt. Despite powering down several crickets, their abdomens never seem to get overly plump. As I acquired these guys in the summer, temps in my tarantula room have been between high 70s to low 80s. I’m assuming that when the winter comes and temps are in the low to mid 70s, their metabolisms will slow down a bit and molts will come more infrequently. So far, both H. pulchripes have been relatively calm when compared to other “baboon” species of tarantulas I keep. The female in particular is fairly low-key, staying out in the open most days and calmly seeking shelter if I disturb her enclosure. The sling is a bit more skittish, but so far she is nowhere near as flighty as my M. balfouri, C. darlingi, or my P. murinus juveniles. This doesn’t mean that I let my guard down with these spiders as I’ve seen their speed and know what they are capable of. The H. pulchripes is a lightening-fast Old World species capable of delivering a very painful, possibly debilitating bite. Also, tarantulas often change disposition after a molt, so I know that the next shed could bring different or more extreme behaviors. Caution and care always need to be exercised with Old Worlds species. Personally, I love baboon species, and I was enamored with the color of this tarantula the first time I saw it. While researching it, I also learned that there wasn’t a lot of care information out there yet for this species, so I was enticed by the idea of possibly getting to blog about its husbandry for future keepers. And I know I already have one female, so a breeding project will definitely be in the future… I’m quite pleased with my purchase, and I’m looking forward to growing these two to adulthood.